Charlotte teddslist | teddslist.com | Charlotte, NC | love local? us too! Help grow our local community online marketplace! 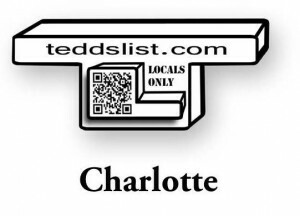 teddslist.com | Charlotte, NC | love local? us too! Help grow our local community online marketplace! Join Our teddslist.com Socially-Connected Community & Use Our Mobile Marketplace On Your Phone, Tablet, & Computer to Save Time, Money & Simplify Your Life. Connect With Other Community Members Who Are Passionate About Growing Our Local Economy Via Supporting Locals by Simply Scrolling, Searching & Sharing over 1,200 Locally-Owned Independent NC Business Owners & Entrepreneurs! teddslist.com is . . .
AN ENTREPRENEUR MINDED INTERNET START-UP FOUNDED LATE 2008 IN RALEIGH NC. FOCUSED ON INDEPENDENT, LOCALLY-OWNED BUSINESSES AND THEIR ONLINE SUCCESS. EMPOWERING ENTREPRENEURS TO SUCCEED WITH INTERNET + MOBILE TECHNOLOGIES.